As health care's focus on improving sepsis outcomes intensifies, HIT vendors have begun offering solutions designed to speed identification of at-risk patients and accelerate accurate diagnosis and treatment using evidence-based guidance delivered to clinicians at the point of care. Unfortunately, many current solutions fall short of the mark, having little or no impact on outcomes. Limited success hasn't slowed innovation efforts, however. The nature of sepsis and the challenges it presents make the condition a prime target for a technological intervention. That—coupled with greater regulatory interest in reducing sepsis mortality and morbidity and C-level interest in driving down the exorbitant costs associated with its treatment—continues to push providers and vendors alike to prioritize the quest for effective sepsis solutions. Claiming 258,000 lives annually in the United States, sepsis remains the deadliest condition treated in hospital critical care units. It is also the most expensive, with an estimated annual financial burden of nearly $24 billion. But the human and financial tolls are just two of several driving factors in the hunt for an effective sepsis solution. An increasingly aggressive regulatory environment also comes into play. In 2015, the Centers for Medicare & Medicaid Services adopted a sepsis intervention bundle as a core measure—Core Measure SEP-1: Early Management Bundle, Severe Sepsis/Septic Shock—in its Inpatient Quality Reporting program. The Joint Commission places an equally high value on sepsis core measures. Yet these mandates have done little to ease the struggle, with bundle compliance at "higher adherence" hospitals reaching only 10% to 30%. The reasons for this are manifold, ranging from the complexity of diagnosis to siloed data and documentation issues. Then there is the bundle itself. SEP-1 requires completion of multiple components within a short window of time and involves a multidisciplinary team beyond front-line clinicians. 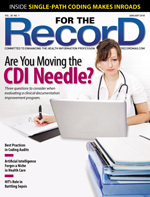 Finance leaders are also prioritizing solutions that will drive down the high cost of sepsis. How high? According to The Advisory Board, the average direct cost per case borne by hospitals for a primary sepsis diagnosis is $18,700, yet the typical Medicare reimbursement for sepsis and sepsis with complications ranges between $7,100 and $12,000. Sepsis volume has more than doubled and inpatient mortality rates have grown by 20% in the past decade. And at 48%, it is the inpatient service with the highest growth projection from 2020–2025. All of this led The Advisory Board to recommend reinforcing nurse-led sepsis protocols—specifically "to rein in the sepsis burden, embed a screening tool into the triage process, and mandate screening for all patients during intake," and "ease compliance by distilling the complex sepsis protocol into a simple four-step bundle for specific staff to prevent treatment delays." Though it is immature, the sepsis solution market is growing. In its April 2017 sepsis surveillance report, the research firm KLAS identified three main categories of solutions: EMRs, infection control and surveillance solutions, and analytics vendors. Their approach to sepsis mitigation falls into two categories: early detection and treatment via real-time screening and alerting, or tracking and improving internal compliance. Unfortunately, because no detail is provided in the KLAS study regarding the magnitude of the impact of these technologies and there was no external verification of the results, there is no real way for providers to differentiate vendors or approaches. For example, a 0.5% decrease in mortality that was anecdotally verified was given weight equal to a 50% decrease that was published in a peer-reviewed journal. As a result, it's not possible to identify which solution performed better in the key areas of outcomes improvement, alert fatigue, and user attrition. When considering a sepsis decision support system, alert accuracy is top of mind for provider leadership. In fact, this is crucial when it comes to measuring the effectiveness of any sepsis solution. This is supported by research reported in the Journal of Hospital Medicine, which found that clinical decision support (CDS) alerting had no real impact on mortality improvement, a failure that researchers attributed to poor alert accuracy. With positive predictive values of <50%, examined systems scored low on test specificity, a primary contributing factor to alert fatigue. When it comes to sepsis, high specificity and sensitivity are imperative. Unfortunately, the typical criteria used for alerting, Systemic Inflammatory Response Syndrome (SIRS), result in far more false-positive than true-positive alerts, thus causing alert fatigue. SIRS criteria are present in many hospitalized patients, including those who never develop sepsis. Thus, when SIRS criteria are used to trigger alerts to potential sepsis, the system has high sensitivity but poor specificity, which results in many false alerts. A study published in the American Journal of Respiratory Critical Care Medicine found that a typical system has 95% sensitivity and specificity of 15%. Based on these numbers, if 1,000 patients had a sepsis incidence rate of 10%, a false alert would be fired for 765 of the 900 patients without sepsis. Due to the difficulty of delivering both high sensitivity and specificity, most sepsis solutions have delivered, at best, marginal results. However, not all have failed to achieve meaningful and measurable outcomes. For example, a peer-reviewed study published in 2016 in the Journal of the American Medical Informatics Association (JAMIA) demonstrated one solution's ability to drive significant reductions in sepsis mortality. Specifically, the tool achieved sensitivity and specificity rates of 95% and 82% respectively, and reduced sepsis mortality by 53% and sepsis-related 30-day readmissions by 30%. This distinction is crucial, as alert accuracy drives both outcomes and adoption. Consider the findings of several additional studies, one of which found that clinicians ignore EHR safety notifications 49% to 96% of the time. • Alert fatigue contributes to clinician burnout, dissatisfaction, and turnover. • The most important success factors were the ability to provide advice to clinicians and requiring clinicians to justify overrides. • The quality of the alert display is one of the most important factors of alert acceptance. • being present within electronic charting or computerized physician order entry systems. Regardless of whether an organization's goals are early detection and treatment or improved internal compliance tracking, identifying a sepsis solution with most or all of these characteristics significantly enhances the probability of success. This translates into more lives saved and fewer dollars lost to what has been an intractable long-term problem for hospitals and health systems of all sizes and types. A complex condition to diagnose and treat, sepsis is a prime target for technological intervention. However, as is true in most forms of HIT, not all solutions are equal. Despite the early nature of this market, it is possible to identify solutions that have a track record of delivering provable and repeatable outcomes. The key is to understand the obstacles to effective sepsis decision support and to take the time to identify solutions that feature the characteristics research has shown to be key to effective CDS adoption for the reduction of sepsis mortality, morbidity, and costs. — Sean Benson is vice president and general manager of specialized surveillance at Wolters Kluwer Health, where he has played an integral role in the development of its clinical intelligence platform, POC Advisor™, which leverages clinical surveillance and analytics to reduce sepsis mortality and morbidity rates.